This software is provided free of charge by Winaero.com but Sergey Tkachenko, called futher as "author", retains copyright. You are not allowed to make any copies or redistribute this software including but not limited to making the software available for download or making this software part of a software CD or any other media compilation. For the exception case you should contact the author directly via email to get the permission. This software is distributed 'as-is', without any express or implied warranty. The author is not responsible for possible damage, which is caused by use of the software. The "Show Menu Delay" option is now available again for Windows 10 version 1803+. HiDPI fixes for the toolbar, the status bar, and the license agreement window. 0.11.1 Fixed a crash that happens for some users when they open the Manage Bookmarks tab. 0.7.0.3 Disabled the accidentally enabled debug mode. Thanks to Paras Sidhu for pointing me. Removed the extra messagebox in the Defender Tray Icon feature. Thanks to Paul B. for this report. 0.6.0.1 This is a maintenance release. Fixed the Taskbar Transparency Level checkbox state. Added a sign out request to Taskbar Transparency Level and Disable Quick Action Buttons. Fixed a crash when the user has OneDrive uninstalled. Fixed wrong Libraries visibility detection under Windows 10/8. Fixed a minor bug in window borders. Added Advanced appearance->Menus. There you can change the height and font of menus in Windows 7, Windows 8/8.1 and Windows 10. Added Advanced appearance->Title bars. There you can adjust height and font of titlebars and window buttons in Windows 7, Windows 8/8.1 and Windows 10. Added Advanced appearance->Scrollbars. There you can adjust width of scrollbars and change the size of scrollbar buttons in Windows 7, Windows 8/8.1 and Windows 10. Added Advanced appearance->Icons. There you can adjust the font of icons in Explorer and on Desktop. Also, here you can adjust icon spacing on Desktop in Windows 7, Windows 8/8.1 and Windows 10. Added the ability to activate the Aero Lite theme. The Window Borders feature is available now in Windows 10. 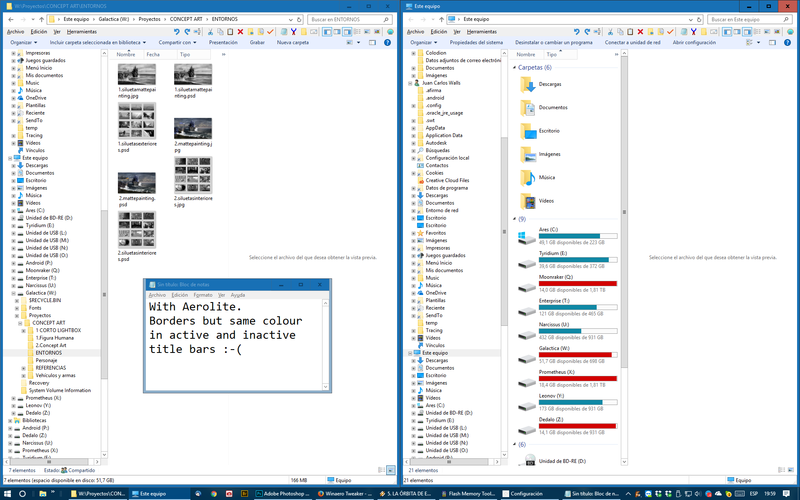 It can be used to tweak borders in Aero Lite and in third-party themes (but not in the default Windows 10 theme which still has no borders!). A bug was fixed in Appearance -> Custom accents. The "reset defaults" button was not working. This is fixed, it works now. v0.3.0.2 Fixed the broken "Get colored title bars" feature in Windows 10. It works now. At this moment, Winaero Tweaker is a portable application and does not require to be installed. I plan to merge my other tools eventually with Winaero Tweaker. Winaero Tweaker is freeware. I can't for the life of me figure out why it won't accept the startup sound I want it to use. It is in wave format and is 3-4 seconds long so if anyone could help me on why it won't work, I will be checking here daily for a possible solution. It is a line from GLAD0S saying "Welcome back. Testing is available." and it is placed currently in 'My Documents'. if anymore details are needed, I will respond when I can. Thanks. Just how the hell many times do I have to keep being told version 2.2.0 is out but get given 2.1.0? A few days ago was annoying. Today I'm getting seriously pissed off. NP. Disable the update check in settings. Why does my taskbar go back to transparent, after a reboot, when I have Make Taskbar Opaque At Windows Startup checked? Which windows version you are using? Windows 8 or Windows 8.1? Can you check that WinaeroTweakerHelper is in your Startup? Hey thanks for this little dirty tool! 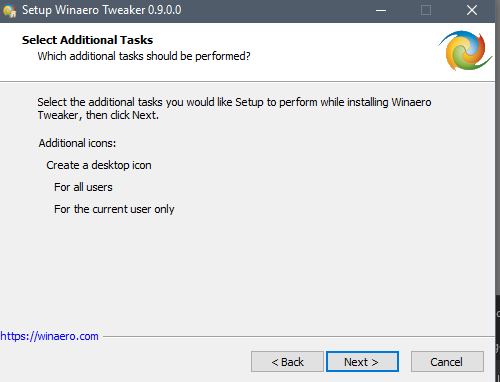 I have no need or interest in winaero tweaker, I just want the opaque taskbar thing to stop asking me to update after every startup, and I can't see any way to since I no longer have the installer and it isn't available. Is there a command line switch or something? THANX A MILLION FOR THE GREAT SOFTWARE! Could not find part of the path 'C:\Windows\Performance\WinSAT\DataStore'. Selecting Continue lets the tool run, and most functions, like changing the Aero colour, work fine. Some options pop up the same error again which can then again be continued through. "Windows Update settings" work for Windows 10 RTM??? I tried this program on Win 10 Final and the Custom Accent colors are much brighter than they should be. Hope you can fix this. Thanks. It is normal. Windows 10 adjusts colors by its own. I cannot fix it. downloading is not working, I can't download anything it just refreshes and that's it. Is there a plain http download page with .exe links ? Can I comment with links here? I tried to make a comment but it failed and I got redirected to a blank page. Is it gone or just waiting for moderation? The Colored Title Bar is works wrong!!! 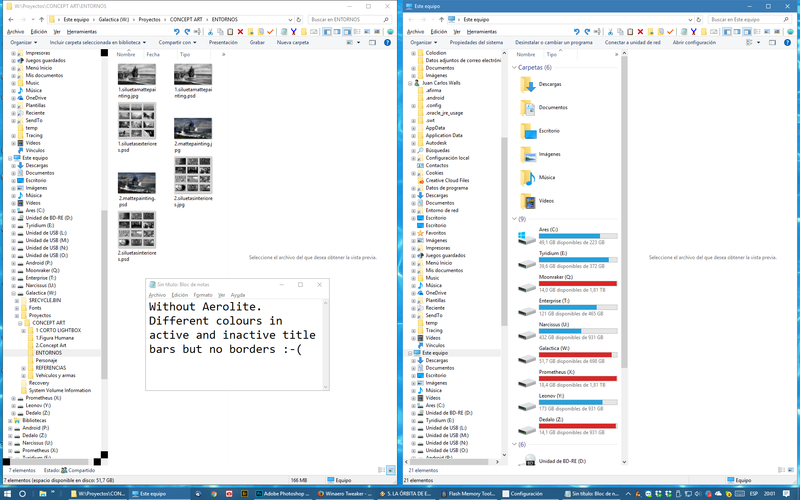 When I switch on the automatic theme colour based on a background picture it's not working, becouse when change the background, the taskbar is going to gray and the colour of the window will be with an other colour than the tray. Hi & thanks for the great app...I have a custom theme in win 10, how do I change title bar colours within a custom theme. When I use winareo tweaker and click use coloured title bars/enable coloured title bars it changes the theme to the standard win 10 desktop but allows coloured title bars. I would like to have coloured title bars in my custom theme. Is this possible? Thanks now I can use Windows Photo Viewer again with a few clicks. ‘Windows Update settings’ section shall be removed / hidden if OS is found to be Windows 10. Kevin how this related to tweaker? It is the operating system. Tweaker does not provide any extra functionality besides the theme file. For the enable colored title bars, is there an adjustment that can be made for the windows in the background that are not focused, where the text in the title bar is in front of a lighter solid color that's different than the main color. It looks odd or I'm not sure if that's on purpose, but aesthetically speaking, it's odd. Any plans to add the tiny borders feature for Win10? Windows 10 has no borders. Plans to translate into other languages? 2. But I have the same gripe as Geoff: themes & colored taskbars seem incompatible. 3. Windows _have_ a colored border, but it's only 1 – 2 pixels wide. A more general problem with the new fashionable "flat" look is that finding things has become more difficult: important icons on the taskbar are just an outline, you can't anymore just click by color, you have to actually identify the shape; overlapping window's taskbars are the same flat color and merge visually; &c.
Similar question as Geoff and Grumpy. Colored taskbars work but remove "theme" settings; when a special theme is applied the colored taskbars are gone. Is there some workabout for this? Agree with the other comments re very nice software.... Thanks!! I have a potential fix for Ollie! I don't know if he'll get notifications from this or if he's even still having the problem but it's an old windows bug! Make sure the name of the file is prefixed with 'Windows' the same way the other sound scheme files are. For some reason the sound is only played if the file is named liked this. I´m using it for win 10 but under appearance "Window Borders" does not appear as an option anymore? Wow! Great app! Thanks for creating it! It would be cool to have an option to enable taskbar blur in a future version! StartIsBack has this option, but it also comes with a new start menu, which is not that great! +1 Same issue here on a lite version of windows 10 home. I will fix this issue in the next release. Thank you very much for this bug report! thanks for your work, but I've an issue with the colored title bars. The background-color from the titlebar-text is only the same color as the rest of the window when it's active. I understand you. But I cannot do anything for you. It is the default appearance and behavior in Windows 10. It cannot be changed, at least at this moment I found no way to change it. Does Turn off Update or "Check for Updates but let me choose whether to download and install them." setting work with WinAero? I ask because under the Description it still say "Changed Windows Update behavior which is locked to ""Install updates automatically" in Windows 10 Technical Preview. I have Windows 10 Pro. 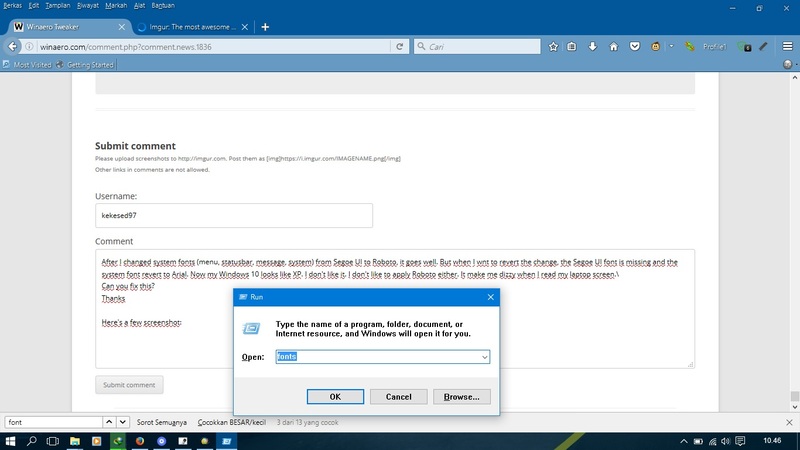 This option was created for Windows 10 TP and does not work properly in the RTM version of Windows 10. I will change it very soon to provide an alternative option, a sort of. Great software, thank you! One issue since yesterday - Firefox updated to Version 40 & the Title Bar colours no longer work. They're still working fine in Chrome. Also, when I click "Enable Coloured Title Bars", the Desktop Background reverts to the Win 10 default & the colour I've selected using your "Personalisation" d'load is also changed to reflect the Win 10 default screen. Is there a way to "lock" these features in place so they don't get changed by anything except my choice? Windows 10 - customize shortcut arrow, remove arrow does not work. I am going to uninstall this app. Good like with uninstalling the portable app. Haha. Help! 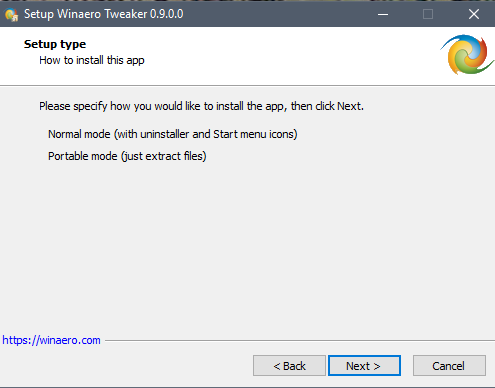 I can't find the download link for WinAero Tweaker 0.3.2.0. Calc and Photo apps always run in background: how to avoid that? Thanks for all you've been doing so far! Nothing changes when I change the volume icon? Forget my last comment. Volume indictor works fine! Thank you for this little treasure, but with priceless. Please, if possible, I would suggest that even in Windows 8 Windows Defender could be disabled. Congratulations on your tireless and admirable job. Is there any chance you can remove the pin icon from the Quick Access items in the navigation pane? Thank you! I think the new style of windows is terrible ugly, this app is really bad looking "things"
It is big lost for me the Microsoft decided change stock application like calc.exe and others for this ... this "something"
Maybe it is possible to create a program with can transform this things back to useful from windows 8.1 to windows 10 if i insert my win 8.1 cd to cd-rom and i can chose what i want change exactly like this great toll "Winaero Tweaker" witch was help me some change do. ISSUE: WAT goes "Not Responding"
REPEATABLE: Almost every time. Although occasionally WAT does not get stuck. WORKAROUND and ANALYSIS: Using Task Manager, right-click on WinaeroTweaker.exe, Analyze Wait Chain. I find SpeechRuntime.exe is causing the wait (Not Responding, i.e. thread blocked). Kill SpeechRuntime.exe by checking it on the Analyze Wait Chain dialog and choosing End Process. WAT continues as though no issue had occurred. Where is the option for taskbar opaque in the newest version? Random, which OS you are using? mickleby, big THANK YOU for this report. I disabled the windows update service and now can't turn it back on. Can you help please? Click "reset defaults". That's it. Thanks for that, unfortunately on my PC it doesn't seem to do anything. I also just noticed that I can't search the web from the search button on the toolbar, it tells me it can't connect to the internet although I know I am connected. I guess I might have some other unrelated problem. Thank you very much for this awesome tweak app. Everything I've wanted to do work very well. Please... How can I change the Text color in the Title Bar. Ive chosen a dark color theme, but try as I might I CANT change the text to a lighter color. Is it possible using your magical tweaking app? Given all the praise here, I am disappointed that I cannot seem to execute this programme. It doesn't even stay in memory long enough for Process Explorer to see it. Using Process Monitor I can see it execute and then terminate, but am not sure why this is the case. Hi there, I disabled the automatic update, and i can't go back, it says: "There were some problems installing updates, but we'll try again later. If you keep seeing this and want to search the web or contact support for information, this may help: (0x80070422)"
I tried the option revert to default but nothing happens, somebody knows how to fix it? First, make sure you are using the latest Winaero Tweaker. Few versions ago it had a bug causes such issues for the "reset defaults" button. 1. Click Start, click Run, type Notepad, and then click OK or press ENTER. 3.Click File, click Save As, and then type Repair.bat. 5. Right click the Repair.bat file that you saved and run it as administrator. Anyway, I will look if everything is OK in the source code right now. I have Windows 10 and used Winaero Tweaker to customize the Aero Lite theme to get closer to a Windows 7 feel. I still have two issues. Even if Winaero Tweaker can't help with these/you don't plan to update it with a solution, can you suggest how/where I should try to fix these? First, when I reduce the height of title bars below the default value, the minimize/full screen/close buttons on the right won't get smaller, only the button edges disappear. Second, I use the taskbar in the Never Collapse setting, with labels for active programs. Is there a way to customize the background color of the buttons/labels? I already had the problem before that the button/label of inactive windows don't stand out well. Now with Aero Lite black fonts for the button labels (which I'm happy with), it is hard to read the label of the active button, which has an ugly dark background color I can't change. It will mess up your win (both win 8.1 or 10) if u are using a HiDPI setting (caused by change icon desktop font, titlebar font, scrollbar size). Your UI will scale wrong ratio, wrong icon space after apply and resign-in ! Could you enable white text for coloured title bars like it is for aero lite? I'd like to have a dark title bar. Also, do you think it would be possible to change the opacity for the 1px border in windows 10? Or disable it altogether? The title bar coloring appears to not work on inactive windows after the latest windows build upgrade. Any workaround? Well just complete the win10 update today and found that after the new upgrade winaero colored title bar is not working anymore...and just found the solution in the Personalize setting, in Colors tab select "Show color on Start, taskbar, action center, and title bar". Yup our kind development team know that we need a coloured title bar so they added it into this option. Hope Winaero can fix it someday. mizuhakei, the new version is on the way. It will fix this issue. You might check the "Enable Taskbar Transparency" option, when you check that, it stays transparent just until you push a taskbar icon (clock options, volume, network and so on). A feature that I would really like to see return to Windows 10 from previous versions is to replace the 'Quick Access' menu with the way it was in windows 7 / 8. The ordering is not necessarily the issue, but more that you cannot rename the links without it renaming the linked folder. For example if I have a shortcut to a 'Pictures' folder on several PC that I want access to, they are all called 'Pictures' in the Quick Access menu. Previously I could rename it to Pictures (Server) etc. Second is to enable re-arrangement of pinned items on the task bar. ie for Excel, I have a number of pinned items. I can't changed the order of these frequently used items without un-pinning them and re-pinning them in the order that I need. A tweak to increase the number of pinned items would also be desirable for me, as I quite frequently use close to 10 excel docs, but when I have 10 pinned, windows will not show any recently used excel docs. Love the software and have been spreading it with everyone I know who is unhappy with changes Windows 10! An awesome program! Any chance that the functions of This PC Tweaker could be added? Very tired of the folders reappearing in This PC / My Computer after every update. Thanks! Keep up the great work! With the new requirement to sign out to apply, would it be possible to add another option to apply on reboot? Often with things that require a sign out/reboot I'll apply the changes then just wait until I turn off my pc for the day, and have the changes applied on startup, as signing out is inconvenient at times. Just press cancel. Changes will be applied next time you sign in. Could you please add this as an option in WinaeroTweaker? I used the latest version of this program and it BROKE my WINDOWS 10 10240 build. I made some tweaks to disable the lock screen and the one to not show last user who logged in... And when I boot up / restart I just see a GREY SCREEN and nothing else. This has me really ticked off. I am now trying to reinstall Windows 10... Use this at your own risk Windows 10 users. PS. I did try reseting all the options back to default... It still kept my windows 10 broken. Hey cool that you have decided to make an one in all application. I wanted to try that out but it seems that the download link is broken could you please fix that ? great app! quick suggestion. the power plan menu is great, but it only shows built in plans. how about also showing custom plans? Thanks for the Compressed Arrows change! There are now a lot of settings in WinaeroTweaker and transferring them to a new PC is quite time consuming. Would it be possible to have Export Settings and Import Settings options? The export could save the settings to an XML or INI file that could then be copied to the new PC and imported with all of the changes then applied at once. It is not Tweaker, it is something else. Tweaks you mentioned just cannot cause such issues. I am thinking how to implement it. But I will add export/import feature for sure. Thanks for your suggestion. It is a good idea to add custom power plans. I will look how it can be done. Is there somewhere to see the complete feature list for Winaero Tweaker please? Nice app, any chance of giving us a tweak to restore the Customize Link in the Notification Area Icons window? I really miss it as i use it all the time. Unhandled exception, parameter is incorrect error won't let me open the program. The standalone version for This PC Tweaker worked flawless on Windows 8.1 but all the download files have been removed sadly. Nonetheless, thank you for creating these. Can I get more details to fix the issue? When exactly it happens? Can you copy/paste the whole error text? The remainder of the message is a list of loaded assemblies and a JIT Debugging instruction paragraph. Not sure if you'll need these as they don't look too relevant. Additionally I am using a 64 bit Windows 8.1 machine; on another 64 bit Windows 8.1 machine Winaero Tweaker seems to work perfectly though. Only thing that bothered me was some of the check boxes are ticked by default when I first started the app. For example 'disable toast notification' was checked by default even if I haven't disabled it. I wanted to know that if I close the application, will it turn off the toast notifications? Aritra, the application reads your preferences from Registry. If it shows the checkbox, it means that toast notifications might be already disabled in your operating system. Thereby I would request you to check out the problems for yourself and rectify issues if possible. . . I will check this ASAP. Aritra, the bug is confirmed. Fixed in dev version, the next version of Winaero Tweaker will not be affected by this issue. Found the cause of the issue. Should be fixed in the next release. Could we add the ability to remove the blue and yellow shield from icons? I am having trouble posting hyperlinks to post you the screenshot. If you Google "blue yellow shield icons" or "blue yellow shield desktop icons", you'll see it. I used This PC Tweaker to adjust the folders visible in Windows 10 This PC. I have downloaded Winaero Tweaker and like the additional capabilities very much. However, the "Customize This PC Folders" feature does not seem to recognize the adjustments made by This PC Tweaker in the past. It looks like the "vanilla", out-of-box folders for Windows 10 in This PC, which is not accurate. How can I get Winaero Tweaker to see the actual shortcuts currently visible in my This PC configuration? Great work Sergey! I really do appreciate it. From the official announcement HERE. This is one hell of a utility Thank you Sergey. I want to check with you if the problem with custom accent colors is Windows based or it has something with the app. 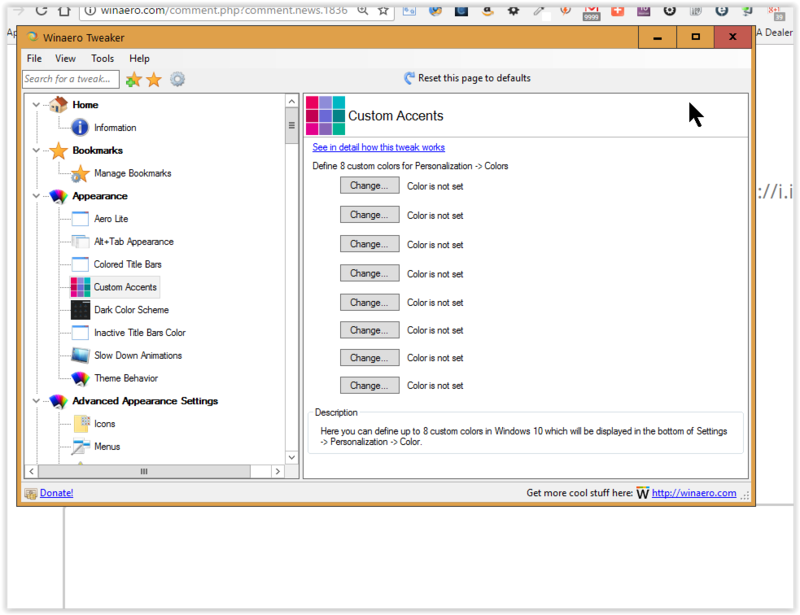 Even though I set custom accent color to black, when I select it from Windows settings app blue one is applied. The problem occurs in Windows 10 1511, build number 10568.164. I cannot change the color of the sign in screen too. Is it possible to change these colors if one is using custom themes? Thanks. This is very useful if you are in search of a clutter free notification center. Windows 10 is well known for adjusting the custom accent color. Currently, there is no workaround for this issue. Try to play with color, set it not exact black but something closer to dark, e.g. dark grey. I love this tool! Makes Windows 8.1 look OK.
Big problem however. Whenever I restart or logout most of the changes I've made with Winaero Tweaker are lost. Any ideas? Every time I open Winaero, it asks me if I want to install the latest update. So I click yes, follow the webpages, download, and then what do ya know...next time I open it: "a new version is available...would you like to download?" So apparently I'm doing something wrong. Can someone direct me to the official link for the latest version of this? It's hard for me (I'm new to this stuff) to decipher what part of the webpage is an ad for downloading software and what I actually need to follow. Please and thanks in advance. Big thanks for this nice Tweak Tool!!! "DefaultIcon" folder + as default value the path to an icon which i has set per Winaero Tweaker. Tested with latest FF x32 on Win 10 x64 with WT v0.5.0.0. Missing in the download dialog from FF in the Navigation Pane! Has manualy add the DefaultIcon folder + icon path and all is right now. Fixed. Thanks for your bug report. Thanks! Excelent app, makes windows a LOT more stylish and customizable letting me get rid of most stuff I hate from it, all of this in a easy user-friendly way. Awesome! Great work. I just do not understand why people make some rude complaining comments taking into consideration this is 100% free! It is ok if you have doubts or ploblems, just try to ask politely and to be a little bit more thankful I mean, come on! Thanks for Winaero Tweaker. I noticed one thing: In the Windows Title Bar section, changing the Windows title bar height only works for (traditional) win32/win64 apps, not for Modern/Metro apps. Is there a way to change the title bar height for these apps? As of this writing, it is not possible yet. It is not a bug of the app. It is a bug in File Explorer in Windows 10. When you disable\hide Quick Access in the navigation pane, it breaks Drag-n-drop. I will add a warning about it. I'm having the same issue of the secondary colour being set to blue. This didn't happen before, so it's either a change in recent Windows versions or in Winaero. Windows 10 is well known for adjusting the color. I still not found a workaround for this issue. For some reason something's turned my taskbar black and I can't seem to get it to match the background colors like I have my windows. Any suggestions? I like the ease with which your Winaero Tweaker lets me go back to colored title bars in Windows 10. But, I first change the background from the Win 10 (very ugly) default to just a solid color, then I use Winaero Tweaker to add the color to the title bars, and magically it has put back the Win 10 default background. If I then change the background to a solid color, magically the colored title bars ARE GONE. Also, I do not see a setting in Winaero Tweaker to change the background from the default. Please add the ability to specify the name of the object is added or after in "Navigation Pane" and "This PC Folders". I use OS Russian language, but there are Chinese and English names in the CLSID. Could you possibly give us a way to take the time and date off the lock screen. I already have a very nice watch, thank you M$. The writing hides my beautiful painting, and also reminds me how ugly M$ has made Windows 10. How do I make a custom startup sound? I am running windows 10 and the current startup sound is wa wa aw waa! Kaspersky Internet Security 16.0.0.614 f is blocking winaero 0.5.0.6 as an unknown object. This is first because never happened in older versions. It is false positive reaction from Kaspersky. No idea why it happens, but it happens from time to time. Is it possible to stop the taskbar icons from changing position when switching between virtual desktops? I have a problem where if i change the order of icons on the taskbar, and then switch to desktop 2, and back again to desktop 1, the taskbar icons i rearranged change back to their original position. Or alternatively, is it possible to have icons pinned on one desktop but not show on another virtual desktop? Gostei da função de cores das janelas inativas, mas teria como lançar uma função de pegar as cores que estão em configurações do Windows para as janelas inativas? wasbarreto, this is VERY GOOD suggestion. Will be implemented directly in the next version! 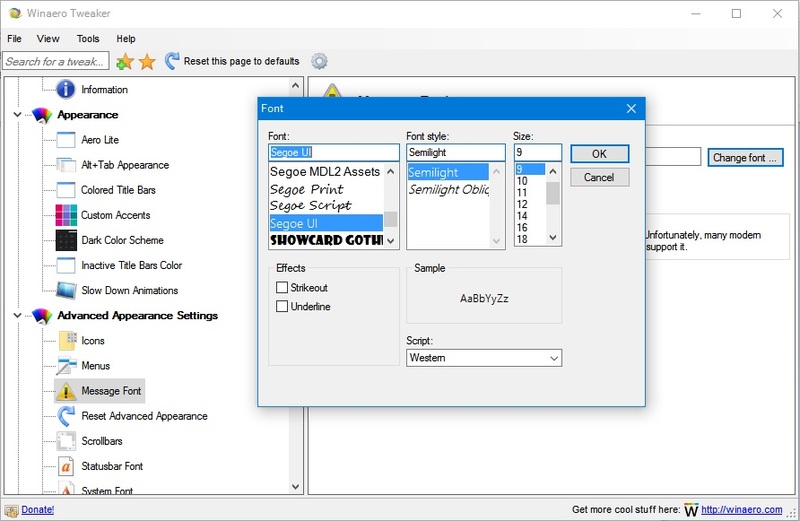 Please add a feature: In addition to changing the system font from segoe UI to another font, please add an option to change de system font SIZE as well. The default size is 9pt, wich does not fit well with other font types. That's a pity. Looks like Microsoft has all classic removed applets. After I change the "Use Administrator Account" Setting, when I use an App an error comes up that "this app can not be used with the built-in administrator account". What do I do to fix it in Win 10 home? P.S. Can you make a setting to change the administrator name from "Administrator"? Good news, personalization menu is working again now, just a question though, was there a reason the theme personalization shortcut was removed? I have no idea. Maybe it was just a bug? Yeah looks like it was just 2 builds with that problem, just hope it stays fixed this time. Very nice program. Best windows utility of 2016, I think. Installing Winaero upgrades over installed lower level versions & you get the settings that are already set. Love that feature. The new install reads the registry? Your secret, I won't pry. However, a neat feature would be: Store the settings in a file (.ini? text? easy to edit?) and allow copy this file to another computer, start Winaero and - walla! The custom settings are moved to the new computer! And if that's not enough, (I'm greedy) do a one or two click upgrade install that just overwrites the old program rather than unzip & copy to directory. And as far as it goes in the debate about programs that run without windows installer, I like simplicity! One last thought - sort your comments in descending date order...easier to keep eye on the new. the new version is detected as a virus with kaspersky antivirus 15.0.2.361 (f), please fix. Is this at all compatible with Windows Vista? Vista is not supported by this app, even some of tweaks will actually work. and is a DWORD32 key called MinThumbSizePx with a decimal value up to 500. And +1 for TommyT's request to save the settings to a file! Can you please add the Registry tweak for ClearType to your wonderful app? I just hid the Quick Access from the navigation pane on Windows 10 Pro Insider Preview build 14393.0 and upon reboot I now find a Quick Access icon on my desktop that I cannot delete or dump in some other folder. Would be much appreciated if this is fixed, as in, the icon is removed. The virus is in your brain. So now version 0.6.0.1 requires net framework 3.5? Why? Sorry, my mistake. Fixed, please re-download the app. Fixed too. Please re-download the app. fuzzy I will look into your issue. Please specify the build number you are running. The Description in "Slow Down Animations" has the word "the" spelt twice. When installed the Aero Light the text on the taskbar buttons becomes black, and it is impossible to read when you have dark grey or any dark theme color. Is there any way to change the taskbar icon/buttons color to something other like white? Thanks. Corrected. It will appear with 0.6.0.3. Which Windows version you are running? Thank you for your swift reply, I run Windows 10 Pro. Can you try to apply it too? This is very strange. Which build you are running? Also., can you email me your C:\Windows\Resources\Themes\aerolite.theme file? I will look what is inside it. I'm curious if the Winaero program has found a way to add a delay to the X Mouse feature with Windows 10? It is easy to get auto focus to work with Windows 10, but it seems to ignore the ActiveWndTrackTimeout registry value. Does your software use a different registry item to set a delay? Or, does the delay simply not work with Windows 10? Unless the user who is logged in at the time of trying to run an elevated shortcut is an administrator, the user still must enter an administrative user ID and password. Perhaps I misunderstand; is ElevatedShortcut only supposed to avoid the need to right-click and select Run as Administrator, but NOT supposed to make the process able to start with administrative privileges when run by a non-administrative user? What I'm looking for is the latter - to allow standard user accounts to run certain processes with administrative privileges, with neither a UAC approval prompt nor a UAC elevation ID+password prompt. On UNIX/Linux the "sudo" command performs as desired. On Windows I'd found Kay Bruns' "SuRun" which can do this; it's very much like "sudo" on UNIX. A bit more complicated to use. I'd been hoping that it would be possible to have a simpler way. So, what is ElevatedShortcut really supposed to do? You need to use the built-in "runas" command and not elevated shortcut. It will not resolve your task. The user will need to enter the administrative password with the elevated task. The Description in "Disable Telemetry" is missing the word "you". I have upgraded yesterday to windows 10 pro from Windows 7 pro. I may go back to windows 7 back within 30 days. Does your tweaker has option to disable Windows 10 updates i.e only check for update manually like in windows 7. It can be set to notify only. You need to apply the option "Method #1" in Behavior\Windows Update settings. It should be exactly that you want. Would be nice if you can create a export features so it easy to move setting from one PC to another. I'm assuming it's a "false positive"? Last time it was Kaspersky, now Kaspersky is silent but Defender is on fire. I will fix them all one day, I just need more free time and money a little. I appreciate your hard work very much. I use this tool on every machine I tune up for people (Win 7, 8 and 10). I have a reg file that I use to enable "Save or Save As" prompt in Microsoft Edge... could you add this into your Tweaker as an option? It would be a real time saver when setting up multiple machines at once! Thank you. After the Aug. 2 2016 update lock screen image is set back to default and tweaker won't change it any ideas? Mark, say thanks to Microsoft. Windows 10 Pro x64 TH2 + Anniversary Update = no lockscreen background change - no way to disable the lockscreen completely using WA-Tweaker. You should able to disable lock screen completely with version 0.6.0.5. What happens when you tick the checkbox? No, I can't disable the lockscreen. I tried manually using a scheduled task. Then I tried by using a group policy, at last I tried with a provided registry hack and WA-Tweaker. Disabling the lockscreen is still not working using WA-Tweaker 0.6.0.6 plus after changing some settings applying tweaks I got a strange bug. I was not able to disable that either. Can you add the classic time/calendar back? We still have the classic volume slider which is nice, but it seems the calendar was removed. Also classic LAN/Wireless window would be nice. Another nice addition would be the classic UAC instead of the new one. Thanks! Love the Application, it helps me make things look so much better than Windows 10. If any of these options can be integrated into future releases, I would greatly appreciate and donate to the cause. I’m using WinAeroTweaker v0.6.0.6 and Windows 10 Pro. I have the option set in your tweaker to disable adding “- Shortcut” to the filenames of newly created shortcuts, but the system still adds it. Any ideas what I might be doing wrong? The Windows 10 titlebar is a problem for me. The three icons on the right --- minimise, fullscreen, close --- are too far apart. They take up too much room when I want to put other things up there. Is it possible to tweak the titlebar by pushing the three icons much closer together, close to the right margin? On Windows 10 I can't get Tweaker to set the lock screen image back to default I click set page back to default but it still goes to the solid color this is happening after the Anniversary update how can I get the image back? Changing the size of margins in "Windows Thumbnails" has no effect in "Windows 10 Anniversary Update". Thank you, will be fixed! any chance to get a portable version of this? The installer has the portable/extract only mode. Lots of people ask "how to remove it, I cannot find it in Control Panel". It was created for such people. Use the portable setup mode, it does nothing else besides the file extraction. This is a great tweaker! I missed a function from this: add Recent Folders for Windows Explorer and Save windows under Windows 10. I use this feature daily, and registry hack is a little hard. Lockscreen function does not work, the lockscreen remains, it used to work with the last version. Since the Windows 10 autumn update (or whatever it's called), the Winaero Tweaker option to prevent Windows 10 from automatically restarting to install an update does not work. Please fix if you can (and thanks for the effort in making this awesome app!) because I rage whenever Microsoft decides it knows what's best for me regarding the use of my own property. "Set Windows update to notify only" doesn't seem to work in Windows 10 Anniversary update. Just want to add that I also had the 0x80070422 error after disabling windows update and couldn't turn it back on, using the latest version. The repair.bat fix above resolved the issue. thank you. You've kept on updating it all the time and it's a real pleasure to see such a tool free for everybody to use. Thank you for this great app. I would love to see an option for tweaking the menu and title bar sizes in Edge, which the current version doesn't seem to be equipped with. After I changed system fonts (menu, statusbar, message, system) from Segoe UI to Roboto, it goes well. But when I wnt to revert the change, the Segoe UI font is missing and the system font revert to Arial. Now my Windows 10 looks like XP. I don't like it. I don't like to apply Roboto either. It make me dizzy when I read my laptop screen. Click "Restore this page to defaults" on toolbar. This will restore the default font. It's ok I found it now...Why dont you put it at the top of the page where it should be...no-one like me needs to see any release notes first...apart from that i love your program and will donate soon when my mortgage has finished. Plz WinaeroTweaker clear Icon 256 x 256! the current is blurry..
paule, ok, will implement it. Thanks for building such awesome tools! I just have one question. I've had some trouble with "Change Folders in This PC". I added a new folder, "Code", to This PC. When I try to add new folders into Code using the This PC window the explorer program takes a long time (~10 seconds) to complete the task (Not Responding). When I try to rename the New Folder there is a similar delay. If I try to create and rename a folder simultaneously the explorer crashes. If however I navigate to the folder's location (C:\Users\Steve\Code) I'm able to create and modify folders as usual. Any idea what to do now ? I tried reset fonts but it didn't help.. Which font you have used? I will try to reproduce. I used Bookman Old Style. Have you found a solution for it ? Any idea why did it happen? Winaero Tweaker Dev, may I suggest a feature to be added that can export all our tweak settings in Winaero Tweaker to a .ini file, and when we re-install Windows, we can just import the .ini file and all previous tweaks will be applied automatically. The fonts option has ruined my system. I wanted to try Consolas but didn't end up liking it, but resetting to default has left some places stuck as Consolas. Chrome browser for example. thank you for teh winaero tweaker. it is an amazing tool. I tried reseting the icon cache, but it didn't work. Would love to hear Your feedback about the problem. Go to Advanced appearance -> System Font. Click the Reset defaults button above the page. This should restore your system font and solve the squares issue. You are a lifesaver, Sergey! 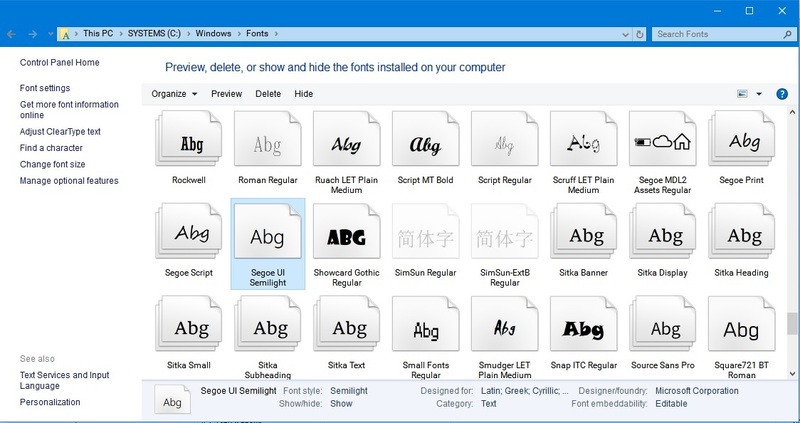 I have been looking all over the internet for a way to change the SIZE of the default UI (User interface) font in Windows 7. I tried your winaero tweeker, but it only allows me to change the font face, but not the font size. DPI idea did not work. I have increased the dpi but the toolbars are going out of the screen. So I already have the maximum dpi. I have tried different themes, but the UI font size is too small in them. I just want to increase the SIZE of the system font so I can read the screen without hurting my eyes. Do you have a program that can do that? Change Search Bar Text is missing, as far as I can see. I don't know if this has been noted already. version 9.6.0.9. I entered 'Cortana' and 'bar' and 'search bar' 'searchbar' in WinaeroTweaker search and it doesn't show up. I see 0.6.0.9 version comes with an installer, I prefer portable version. Can you add portable version download please ? Winaero Twaeker worked fine on two of my windows machines. I just installed it on another one and Inactive Titlebar Color setting is missing. What happened? On your third PC, it detected that the Inactive Titlebar Color setting is not available in the installed build of Windows 10. This feature doesn't work in older builds. Suggestion: Allow Save/Restore configurations? Optional Command line args to silently configure system. Tweaker installed OK and will be very useful, but I had really great difficulty downloading Win+X Menu Editor, there seemed to be something wrong with the link. Anyway, I am now getting notification about downloading an update but cannot find how or any reference to it on the website. Nor can I find how to ask for help, hence I am posting here in the hope it gets noted. Hi there. You software is amazing, thank you for all your efforts. I just have a couple of questions, I am using Windows 10 Pro & have changed all the default fonts using your program but it doesnt change the font in the start menu, have i done something wrong? Also, i have set a pin for sign in & after applying the font changes, the pop up keypad now displays squares instead of numbers, this again may be something i have done incorrectly but wanted to let you know. I don't think it is you. It is more likely an issue with the font which is missing some symbols. Anyways thanks for this helpfull tool of yours, have a nice day. I have a 14" 4k screen, and had a couple programs (not DPI aware) which came up super tiny. I found a way to force them to display correctly via a registry entry and manifest file. Any chance you could incorporate this trick into the Tweaker? I installed your Tweaker on a Win 10 system. I don't see the option to change the startup sound. Is that only for Windows 7? I haven't found any successful way to change either startup or shutdown sounds in Windows 10 - have you? hello, but this app can degrade peformance in gaming? You do an excellent job and I admire very much and I am fan of your work, congratulations! The color that windows 10 v1607 uses to display the selected item is very poor and in some applications (Like µTorrent) it is difficult to differentiate it from white. Would it be possible to change the color that Windows 10 v1607 uses to display the selected item? I did not find it on your Winaero Tweaker, would you be able to add this feature to your Winaero Tweaker? It's probably been asked before - since it now boasts quite a lot of settings, it'd be great if Winaero Tweaker would alert us in case Windows reverts any of the changes! It tends to happen, especially after Windows updates but it's not always easy to know. Have Disable Cortana checked, but the process is still there. Windows 10 Home, latest version of Tweaker. You do an excellent job. I’ve never seen anyone do it better, Thank you! I have no links at Softpedia. I am not related to Softpedia in any manner. When we Brazilians, we will have the time of this wonderful tool in the "Portuguese" language! And when we can contribute to the growth of the community, through mechanisms, here in Brazil !? One suggestion, for the error of programs like AutoCad, which has files with the same name of "ScreenSaver" ... Leading to conflict between both! I am missing one thing. Make it possible to change the colors of tabs in Edge - and any other application that uses tabs. E.g. Chrome. Active and in-active tabs almost have the same color and I would like to change that. Using version 0.7.0.0 of Winaero Tweaker and there is a tickmark in Disable wide context menus but Windows 10 Anniversary Update is showing normal wide context menus and there is no registry key. If I remove the tickmark and put it back then the ImmersiveContextMenu registry key is created and after a restart the wide context menus are indeed disabled. If I then remove the tickmark the registry key gets deleted and after a restart the wide menus are back but the tickmark is back in Winaero Tweaker. I just like to say the Winaero Tweaker is a very handy tool, and works perfect. Perfect to change the menu font size etc, because that option is removed by Microsoft after the Creators Update. Unfortunately with this tool you can’t change the font size of the Windows 10 Menu. Maybe it is something for the future Thx to the developer. Can you possibly add the ability to change not only the system font itself but also the selected font's attributes (boldness and font size) in the same way you have created for the Statusbar Font? I am part of the Windows 10 Insider program and I am currently running Windows 10 Pro Build 16170.rs prerelease.170331.1532 and I like your Winaero Tweaker 0.7.0.0 App since Microsoft has deleted the ability for users to change fonts and font attributes. The problem is that if I change the system font from the default Segoe UI font the colon in the time display on the task bar displays a rectangle box instead of the colon. Hello. Unfortunately there was a new update 10, with a new windows defender. And the option to disable Windows defender not working anymore even with the most current version. No disables Windows defender when you restart the machine. I'm waiting for a new update. Hey there, big fan of your programs. But currently none of your download links are working for me. However I do use a very restrictive hosts file. Could you please tell me where these files are hosted? I am aware of the issue with Defender, it is already fixed in the developer build of the app. This will paste just the hash value to the clipboard and without the -noexit of the normal command. I had been having issues with... most of the window metrics settings, and I think I know why. When WinAero Tweaker writes the settings to the registry, it uses the 'minus sign' defined in the user's locale settings. In English, that's -, but in my [japanese] locale it was ー. But windows doesn't understand the settings with ー in them. Whatever locale its using, the registry needed the minus sign to be -. Hey there, I love this app, but somehow after I installed it, my toast notifications had disappeared for programs such as Discord and Telegram. Does anyone know how I may go about re-enabling those? I've tried the 'Notifications & actions' page and got no success. CatarsiSol, if you have enabled "Balloon notifications", then disable this option. reza, the application already supports Creators Update. Which exactly issues you have? I enabled and re-disabled the balloon tips to no success in getting back the toast notifications. For some reason, they don't seem to want to pop up on apps like Telegram or Discord. Where are the tweaker settings saved? Like bookmarks for example. I have "portable" Winaero Tweaker and have several bookmarks. When I copy the program to USB and run it on another PC all bookmarks are gone. This is not portable. "A portable application (portable app), sometimes also called standalone, is a program designed to read and write its configuration settings into an accessible folder in the computer, usually the folder where the portable application can be found." Since the Creators Update, I'm again receiving the side notifications about "Windows Firewall being off, please turn it on, blablabla". I used "Disable Action Center" but still see them. Uhm... I don't think this is working correctly. "Ending character's missing in the string"
Something went wrong with the file or folder path. Can you tell me what was the full path to your file? Great tool, thank you so much! Like the old fashion taskmanager too. I use it in combination with the "Ultimate Windows Tweaker 4.2.3". System is now more responsive, quicker after all the Tweaks I have done. Great! REQUEST: I want no writing at all on the lockscreen --- just the beautiful painting that I have put there. Could you possibly add a tweak to remove the ugly date and time that sit over the top of my painting in Windows 10? (Using Winaero Tweaker 0.7) Whenever I try to remove the "Quick Access" in "Navigation Pane - Default Items" and restart the computer, I notice something weird that happens. The "Quick Access" icon appears on the desktop and back in the navigation pane again until I either manually open up Winaero Tweaker again and change it or unless I go to "Folder Options" of File Explorer and check or uncheck the "show recently used files in Quick access" and hit apply. So no matter what I do, I always have to manually change something in order to prevent it from reappearing in the navigation pane and on the desktop every single time I restart the computer. Notably, it appears at the bottom of the navigation pane instead of at the top where it used to. Bad news regarding the appearance menu tweak: the creator's update made it useless, and the entries no longer appear in the classic-style control panel either. I would advise the deprecation on all future builds of Windows 10. P. S. The menu itself shows up as normal but its functionality has been nerfed as a result of the change in procedures as everything now goes to the UWP version of the settings app REGARDLESS OF THE SOURCE DIRECTIVE thereby invoking redundancy. I wouldn't be surprised if the appearance menu tweak lacks all effectiveness when Creators Update Phase 2 arrives in Q3 of 2017, hence why I recommend its deprecation from the Winaero Tweaker app effective immediately for all Windows 10 updates reciprocal to Creators Update Phase 1 (production build 1703) and its respective insider preview builds. REQUEST: Since installing the Creator Update, the Mail app icon keeps reappearing on my Taskbar (next to the Start Menu icon on the bottom left). I use The Bat! for email --- I never use Mail and never will. I keep removing the icon by right-clicking it and clicking 'Unpin from taskbar', but it just comes back. Could you possibly give us a tweak that will permanently remove it (and probabily other annoying icons as well)? Hi, it's a amusing work you did, perfect work for me to adjust the Win10. But i wonder is there any backup the whole setting for future use, that is, for another PC's use (no use to set it up step by step again)? DragonChu, the backup/restore feature is in the development. Great software, thanks! Any chance to adding interaction with sysinternal tools? Is there an updated version, newer than 0.7? I want to donate, is there a way to do that without paying Paypal fees (I'd be sending in Canadian)? I don't want to use a credit card. Thanks. Daniel, well, thanks just for your intention. I really appreciate it! Money is not the meaning of this life. I am really happy that you found my app useful. kushagrasrivastav729, every page has a special button on the toolbar "reset this page to defaults". Use it. Il y aura une version traduite en Français un jours ? @George, one day it will support MUI/translations. I use Winaero Tweacker to restrict Terminal Server to Hide the NavigationPan Default Items and Customize this PC Folder. Now i have the first Server2016 with Winaero Tweacker Version 0.7.3.0 toto this also, but the Folder still be visible.??!! Should Winaero also working on Server2016. I have Windows 10 Version 1703 and I wanted to add some thickness to my windows to avoid 1 pixel or invisible borders. I know Aerolite can do the trick but the problem is when I apply it, the title bar of active and inactive windows is the same so the only way to tell what window is active is the red close button. I tried several tweaks but with no success. It seems the only way to have a different colour in the inactive title bars is using the default Windows10 Aero so no borders. ¿or am I missing something? I saw now that the Settings worked for the Adminsitrator on the RDS Server but not for den RDS User on the Server??? I will Disable the Navigation Pane -Default Items for all User. Hi, I downloaded the latest version of Winaero Tweaker so I could make the font larger in the File Explorer menu in Windows 10. That part works fairly well, at least well enough that I can now read the menu items. However, something has changed in how File Explorer returns the results of a search. Now when I do a search in File Explorer for files containing a specific word, I'm basically interested in files that have that word in the file name. Before I used Winearo Tweaker, the list I would get back had the search word or phrase highlighted in yellow. If there was no highlighting it meant that the search word or phrase was in the contents of the file. It made it much easier to just look at those files with the word in the name rather than everything in the list. It makes it much easier to have the highlighting if you get back a list of 1500 items and only 8 of them have the search word in the file name. Is there a way to have the highlighting back or could you add that to a future update as it is extremely beneficial? "Desktop Wallpaper Location" Context Menu. For win7 get error when use context menu. Please hide for old OS. 6/25/2017 I am visually challenged. I am using windows 10 version 1703. 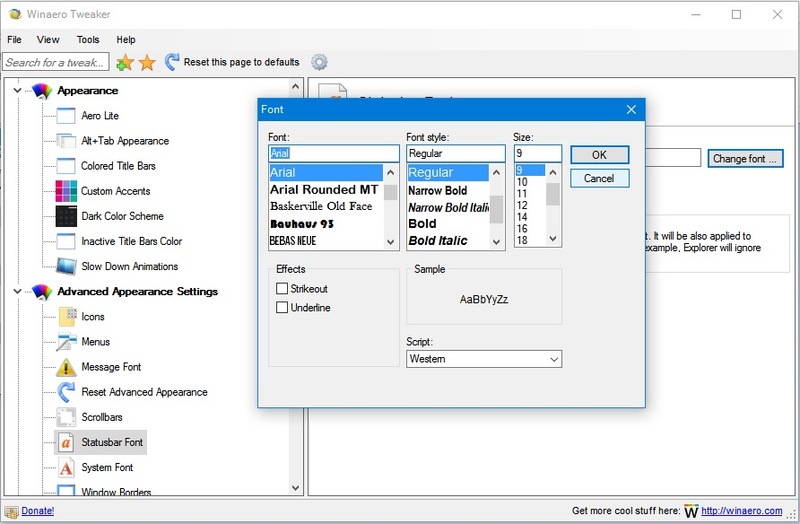 Winnaero Treaker is a great program for adjusting font sizes in windows 10. However the application dialog box for Winaero Tweaker has text in very small fonts that are barely readable.Can you provide a method to make program n text larger? I set up everything on Win10x64 14" laptop. But when I get to office, and connect it to 2 monitors, which have different DPI settings, and then disconnect them, some settings are messed up (in example the window border thickness, padding, and such. Anyway to remember the settings while monitors are disconnected? This is a very excellent tweaking tool Sergey. I've been using it for ages. But I like to know if you can add "Photo Viewer Background Changer" option to it. I use your tool "Photo Viewer Background Changer" to every time I fresh install new windows 10 builds. Hello, it seems as if the font dialog (when changing Window Title Bar/Border/Statusbar fonts does not allow the user to select a bitmap/monospaced font (such as Fixedsys, System, etc.). Is there any way to enable this in the dialog? Okay, I will do right in the next release. If I not mistaken, they won't be applied by the OS. Turned off but did not "Stick" on required restart: Cortana, disable Store, disable login screen image. Did not even let me change it (main reason I downloaded Winaero) - Windows Defender. I clicked on both boxes and it said I had to reboot for them to take effect (which then unsticks the items mentioned above again. It's an endless cycle. Have you a fix for that? I think this has real potential. Also, I didnt see anything to turn off whatever prompts you constantly to "allow this app to make changes to your computer." Is that Windows Defender? If so, that's another proof it did not work upon reboot. As soon as I rebooted, I got prompts for the Security and Maintenance Action Center. I would LOVE to turn those off. I've somehow set up an appearance I really like, but I can't remember quite how I did it, and I want to replicate it on other systems. I've got menubars in a sort of tan colour, with orange accents. A useful facility for a future release might be a way to export all your tweaks as an XML file, and import into another instance? I don't recall picking individual colours for this "theme", so any idea what I did? I had X-mouse enabled (100ms) prior to the Windows 10 Creator's Update. After the update my taskbar pop-up windows would disappear before I could mouse over them. I disabled and then re-enabled the option, and changed the time, and it works now. Is it possible for "Winaero Tweaker" to hide unnecessary settings if it detects a N, KN or a LTSB edition of Windows 10 like when it detects a complete different Windows (e.g. Windows 7). This is truly an amazing tool. Thank you for this. Feature Request: It would be really nice if there was a quick way to "unexpand" all of the options, so that I could easily get to the option I wanted. Right now what I often do is click through all of the top level arrows to "unexpand" them all. Love this amazing tool. Thank you so much for it. Feature Request: Ability to quickly minimize all of the options. Sorry to hear that the app is disappointing for you. I am working hard to eliminate bugs and improve the app. Still, it is far from being labeled as "stable". Can you tell which issues exactly are you facing? So I could fix them. the time display on the task bar displays a rectangle box instead of the colon issues happened to me too and even if I change fonts back it stays,.. My Colon is Damaged!!! Go to the option System Font and click "reset this page to defaults" on the toolbar. There's a new GPO setting in 1703 that will allow to customize the Settings pages. Any change to incorporate this into Winareo Tweaker. Here is an example, https://github.com/DrewNaylor/HideSettingsPages, of someone developing a GUI. Vasudev, read carefully How to import and export tweaks you did with Winaero Tweaker. Thanks for a great and useful program! Noticed an issue in 0.8.0.0. When I selected Export tweaks, then Browse, it attempted to use a default filename "Winaero Tweaker_8/17/2017.ini." Obviously, the slashes are not valid characters in a filename. I npticed in your example that the dot was used instead, and that worked, of course. Perhaps in other locales, the slash as a date separator isn't the default separator as defined in Windows, but in EN-US at least, it is. Perhaps the slash, if detected by Winaero Tweaker as part of the system-defined date, could be translated to a hyphen? I didn't think that the locale depended separator could give an issue. I will fix it in the next release, it is very easy to fix this bug. Thank you so much for this program. I tried three other ways to increase font sizes after the Windows 10 Creators Update and none worked. I can't believe Microsoft has decreased its accessibility at a time when so many other companies are finally improving theirs. Then I found your program. Worked perfectly and I can see everything much more easily again. I have sent a donation in thanks. @Sregey wat...I don't have any problems with it LOL, haha I think something got lost in translation - when I said this tool is dank as all hell I mean it's frigging good. There's nothing else I know of that's as comprehensive as winaero tweaker. If you've ever heard the term 'dank kush' or 'dankest kush' that'll give you an idea of what I mean haha. Googled what does it mean, now everything is clear! Sergey, Awesome updates to v 0.8.0.0 I always wanted the ability to import and export changes. Thanks! I Want to Give Feedback for the Import/Export Tweaks. When Exporting a Tweak I think Instead of Changing the Extension to .ini you Should Change it to .reg and Use the Registry Lang Because Even People Without WinAero Tweaker Would Be Able to Open it And Also you Can use the Program but .ini is Only for WinAero Tweaker And I'm Pretty Sure all These Tweaks Change the Registry not File Explorer and if not Theres Probably a Reg Command that Can Edit Files. Hi, WinAero Tweaker is wonderful, but here is what I think is a bug. Under Windows 10, if I go to the Colored Title Bar page and click "Reset this page to defaults," you restore the Windows desktop to the default desktop, not the solid color background that I selected. Can you fix this, I hope?? Again, this is a splendid program! I am using version 0.8.0.0 and I have enabled the option to prevent system reboot after installing updates. But with the latest update (2017-08 Cumulative Update for Windows 10 Version 1703 for x64-based Systems (KB4034674)), my system rebooted after updates anyway. I really can't stand Windows rebooting my PC. I hope you can fix this feature. After customizing the Quick access item, it shows up a second time in the navigation pane on occasion, either after cutting, pasting an item or sometimes just on it's own when opening a new instance of windows explorer. After customizing the quick access item, it sometimes shows up a second time in the navigation pane of windows explorer. Even if I reset that page to defaults, it continues to happen. Sometimes on it's own when opening a new instance, or after cutting or pasting items. Some tweaks do not have any effect on Creators Update. Microsoft Sad. But have hopes that you will find a solution. Previous few comments have confirmed the tweak for restarting after updates also doesn't work. Thanks for sharing such a useful little utility and your time! Throw OneDrive on the pile of tweaks killed by MicroShifty. I use 3 monitors, my resolution is 5760x1080, and I have the 'Classic UAC Dialog' in use. Normally I have 1 window open and full screen on each monitor, 1 per monitor. Whenever the UAC comes up, it explodes each window to cover all 3 monitors. So every time I bring up the UAC dialog I have to shrink each window, drag them back to their respective monitor, and re-maximize them to fit that monitor. Let me know how I can help you determine the cause of this bug. Thank you. This update has disabled the improvements obtained with Winaero, for example, in Avanced Appearance Settings -> Menus, this command does not work anymore. Several times, even restarting the computer, and the changes are not established. Therefore, I am afraid that the rest of the winaero options do not work correctly or do not work absolute!!! The people of Microsoft are a real scoundrel !!! Sorry, my previous comment was wrong. I was not activating the options of choice of font and custom size. Now I have managed to change the size and the fonts. However, I maintain that Microsoft are real scoundrels. Thank you very much for your work and, I apologize for my previous and wrong message. Hello, sorry one more time. Now I can say that I was only partly wrong in my last message apologizing. If with the Creator version it has been very easy to make changes with Winaero, in this latest version of Windows the changes are much more difficult, and I had to use additional tools to Winaero. I hope you take note that the last version of Windows 10 your Winaero program is much more difficult to use. The Give Access To context menu command, which was named Share with in Windows versions prior to Windows 10 Fall Creators Update, is a special item which allows you to quickly share the selected file system object like a file or a folder with other users of your PC. If you find no use for it, here is how to disable it. I have attempted to do this via Winaero Tweaker (v0.8.0.0) by ticking the Context Menu > Remove Default Entries > Share with/ Give access to box. However, it appears to have the unintended consequence of removing the Sharing tab in Properties? Thank you very much, Sergey, for all these tweaks. They make Windows so much more firendly. SHOW SECONDS FOR THE FILES IN THE FILE EXPLORER PANEL: Is it possible for you to add the option of displaying seconds in the 'date modified' column of File Explorer's display of files? The date--time format there seems to be based on the "Short Date" and "Short Time" in Control Panel, but adding seconds to that time setting is not respected by the File Explorer display, which still only shows hours and minutes. When checking update program says there is a 0.9.0.0 even webpage says the same, but only link to 0.8.0.0 ? also can you show where the option to add the program itself to start-up ? Forgot to update the page. Done! >>also can you show where the option to add the program itself to start-up ? I can, but for what? I have Win 10 with Creator Update and need to increase font size only on all sites. Please advise how to do that with Winaero Tweaker. Unable to do it with the latest Window update. Ctrl+Scroll Mouse Wheel in your favorite browser. Also, you can open its preferences and set the desired zoom level by default. using 0.9.0.0 & still seem to have the issue with the clock : not showing after making changes to taskbar appearance transparency. I also changed system font ( increased size to 10, was at 9, & made font semi-bold, left it at system default used one ) just needed to make it easier for me to read with such bad eyesight. I tried removing the changes I made but it still isn't showing correctly. Is it a bug or something is messed up ? Have a question regarding a setting & where it is to change what it does. thanks for the help, I just cant seem to find where this setting is to stop it. I downloaded three times the zip file, and always the same issue. It is A BUG in recent Insider preview of Windows 10! Not a bug in the app. Great app, thanks. One note. For "Windows Version of Desktop", it's not necessary to sign out and back in to apply the change. A refresh of the desktop is all that's needed, at least on Windows 10. You have the correct option page. 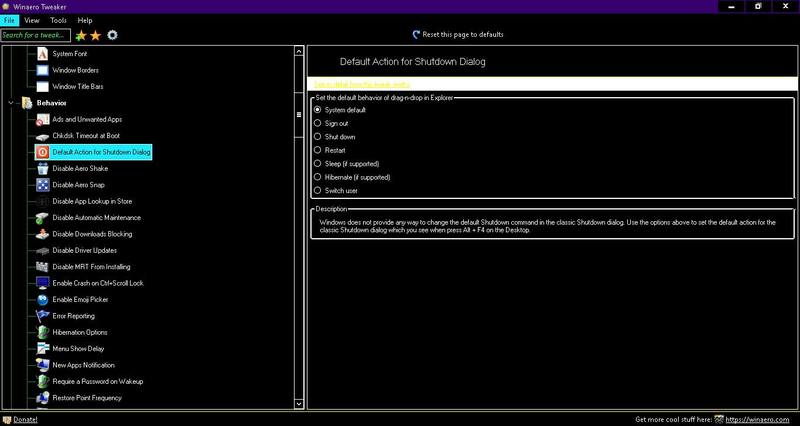 These are settings for the classic shut down windows dialog. Thanks, I will add a new requirement to the app. is says something like "set the default action for drag and drop"
Since upgrading to Fall Creator Update, Find Lock Screen Images feature has been always offering to get the same picture (as seen in the screenshot), no matter what current picture would actually be. Yet, if I click on "Get all images stored on this PC" then I can manually find the right one. I've just upgraded to the latest Winaero Tweaker version 0.9.0.0 but there was no change. Just wanted to report that multiple users are having issues with the Segoe UI Regular font. 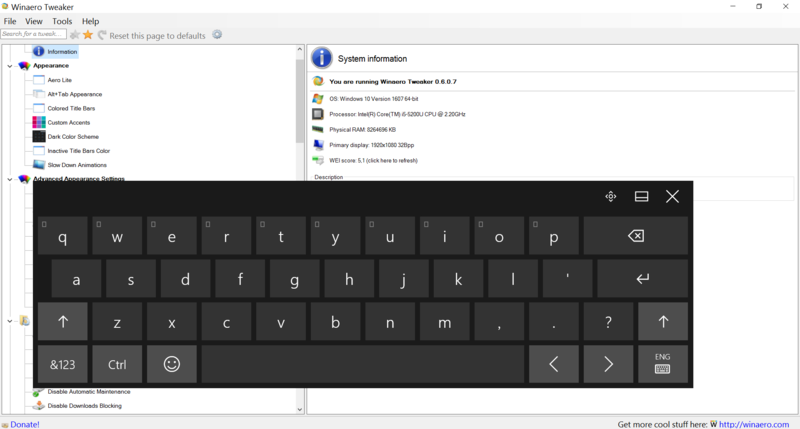 After changing system font using Winaero Twaeker on Windows 10, the Regular weight from the Segoe UI font face is missing from the system. The only way to restore it is by reseting the dialogs in Winaero. Hello, I'm using the latest version and on Dec, 14, 17, I was forced to update windows 10 even though I've selected disable windows update service. Not too long ago another update was forced upon me and now I have Windows 10 Update Assistant shortcut on my desktop. This is very frustrating as I would prefer not to have updates every single day hence why I disabled it. I've been using winaero tweaker since Mar of this year and this is the first time I've encountered this problem. I also noticed that when I select 'Disable Telemetry' it resets itself some how. Any help would be highly appreciated as winaero has been extremely useful/helpful. Thank you for your time. Old versions can change title bar height on the fly, but newer only after log-off. Can we have old behavior back? It is already fixed in the dev version, but not released to the public yet. I cant login to my windows 10 after change the system font. Now my computer stuck in lockscreen. Anyone can help ? Would it be possible to implement a "collapse all" function or a setting which let the tweaker remember the appearance? Please add this to Winaero, specially Pin Recent folders as a separate category, next to Quick access. I installed Winaero and used it to get rid of the shortcut arrow ("No arrow" selection). The result is that I now have an overlapping Windows generic icon overtop almost all of my icons. The only way to prevent this is to go back to the shortcut arrow. BTW, I'm on Windows 7 64-bit. by the way, winaerotweaker doesnt show folders added in by This PC tweaker. I am on windows 10 ver 1511 Build 10586.962 - I have NOT made any recent changes to my system but my scrollbar and button has reverted back to the small windows default. I have changed it with Winaero but it has no effect. I have even done the regedit "ScrollWidth" thing - but still no change. What could be happening here? Should be enough to do the following steps. 1. Go to Navigation pane - default items. Press "reset to defaults" on the toolbar. 2. Go to Drag-n-Drop default action and reset it to defaults if you had changed anything there. Also, I will be more than happy if I can disable the 'round user image' on the lock screen. Hope to see in next updates! I just downloaded and donated but I cant figure out how to save the changes I want to make. For instance, I want to make the scrollbars thicker. I move the slider. Nothing happens. I press the button "Apply Changes", nothing. I go to the menu and look for a "saved changes" option. Nothing. Help please. Anyone! You should be prompted to sign out and sign-in back to your user account. After that, the OS will apply the change. Thank you very much Sergey & Gaurav for one of the most useful software and the best tweaker ever! if it possible... on the next version add a tweak that resize (make bigger) the favorites & commands bar in Internet Explorer 11, they're tiny in very high resolution. can this use with windows 10 insider build? Are you ever going to fix the clock error that occurs after installing Tweaker? The clock in the lower right corner of the computer screen lost the Colon (:) and replaced it with a little square (▫) very annoying!!!!!!! This can't be fixed. It is a bug in Windows, not in my app. Please release Winaero Tweaker 1.0 for Windows 10 RS4.